Well, it was mad rush getting ready to leave our house for 5 weeks. Remembering to pack the necessities, as well as Christmas presents and doing our best to leave the kitchen sink in the kitchen at home. That was 7 weeks ago already! We have been back for a little over a week now. After a wonderful 5 week visit home, we left Cape Town on a gorgeously warm Thursday evening, arriving in London early on a relatively warm Friday morning, only to be plunged into below freezing temperatures on the weekend. A few days later the chilly weather produced some snow for us. Cold + wet + low grey skies = ick! Freezing + cold + snow = YiPEE! Walking to work on Monday morning was lovely. I grinned for the whole 20min walk, even a grumpy old man moaning about the snow couldn't take my snow-happy-grin off my face. 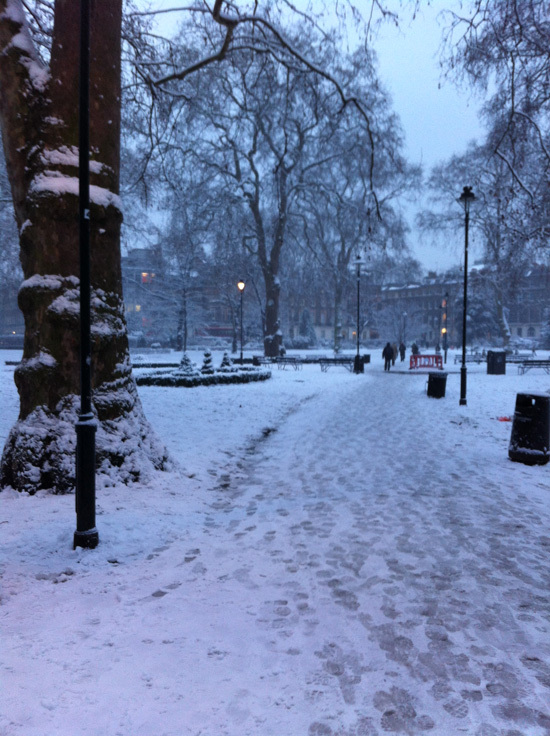 I took these photo's around 8am, before the snow had been trampled to sludgy brown moosh. 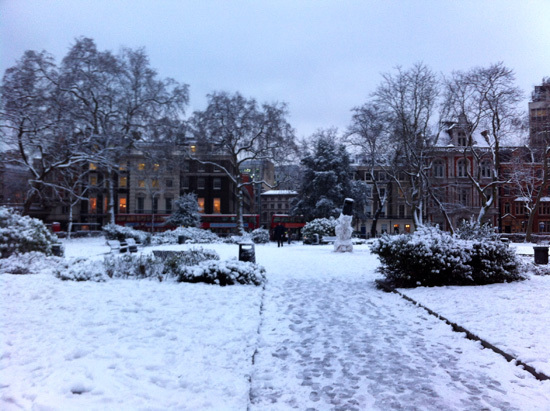 The top picture is of Russell Square. There are lots of paths in that park - this was the only path visible, the others were still completely covered in lovely fluffy, crunchy, fresh snow. 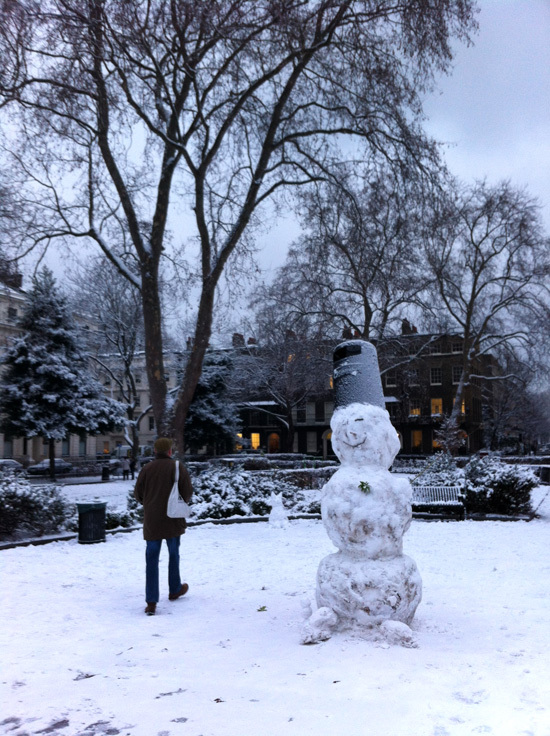 This one is Bloomsbury Square. See the snowman? 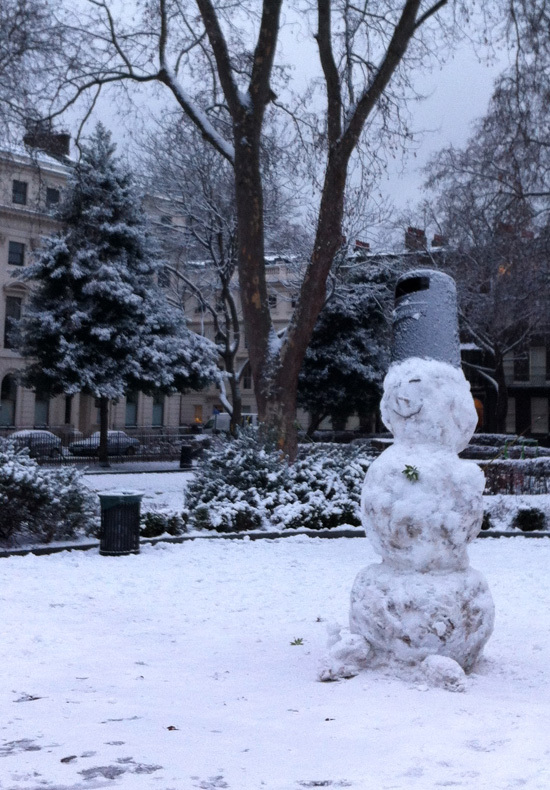 I won't share with you what that lovely snow man looked like by the end of the day. Some kids obviously had a wonderful time slicing him into bits. The cat too. Our garden is still covered in white. I am surprised to see white every time I look out the window... weird. In the meanwhile, how is your 2013 treating you?